Processing: Images were captured with CCDSoft. Aligned/stacked and dark subtracted in Astroart ; Sigma Combine method was used for stacking subs. All channels were scaled and rough color balanced in Astroart. Central Gradient removal was done in Astroart. Channels were co-registered in Astroart. The 9 minute 1x1 exposures were combined for the main luminance construction . Level adjustments and curves were used to bring out object features. LRGB combine was done in Photoshop. A light background noise reduction was applied in PixInsight LE (SGBNR) and with surface smoothing in Photoshop. Final touches and color balance in Photoshop. Final Image size is approximately 3352x2532 (resized to 2800x2100). All exposures in this image were guided; North is up in this image. 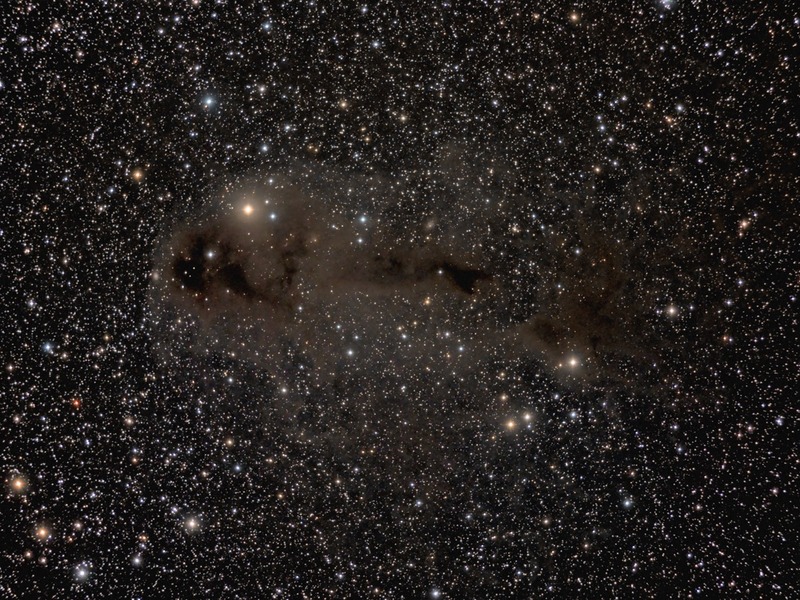 This is an extended cloud of gas and dust that is considered a low mass star forming region. The two little galaxies are PGC 69472 on the left and PGC 166755 on the right. The Horizontal FOV is 124'. Image center is located approximately - Equatorial 2000: RA: 22h 33m 21.9s Dec: +75°18'31"